MK is in a dilemma, having forced to move to her father's isolated house, leaving civilization behind. She just couldn't understand her father's obsession of finding and discovering small people in the forest. One day, she just couldn't take it anymore and decided to leave. However fate has a different plan for her, allowing her to experience a once in a lifetime miniature expedition which will lead her back home to her father. A honest to goodness story with wonderful animation and funny, laughable plots. Totally enjoyable while immersing in the beautiful mother nature. 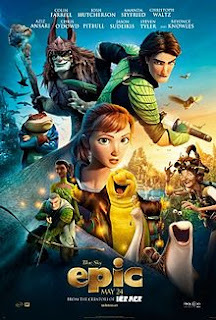 Just got to know it is based on a children's book by William Joyce called 'The leafmen and the great good bugs'. A superb treat for the family.